In my mind, biking is synonymous with freedom. A lot of people who start biking again as adults have an I-feel-like-a-kid-again moment when they rediscover cycling. Bikes gave so many of us our first taste of independence. Getting a driver’s license was also an important independence milestone, but becoming a driver was accompanied with concerns about speeding violations, parking tickets, car crashes, insurance premiums, expensive repairs, breakdowns, oil changes, rotating the tires, and more. We weren’t burdened by adult responsibilities when we road our bikes; all we had to worry about was making sure we had enough energy to make it back home. No one will admit that the Vélib’ program is flawless, but it was a remarkably bold step on the part of JC Decaux, the adverting firm financing the program, and an indicator of growing corporate interest in the cycling movement. Jean-Claude Decaux, founder of JC Decaux, began convincing French municipalities in the early 60s to allow his company to build bus shelters in exchange for the rights to sell advertising space on the shelters. The bus shelter scheme was such a success that the company applied the same model to all kinds of public structures (which the company refers to as “street furniture”)—from information kiosks in airports to public toilets on street corners. A core part of the JC Decaux business model is that they trade public services for the rights to advertise in public spaces. 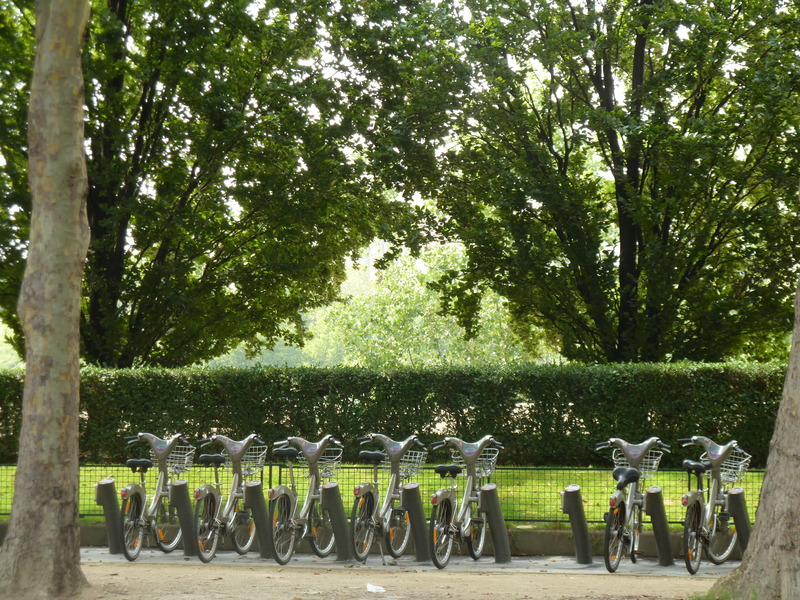 Offering a bike share program to the Mairie de Paris (Municipality of Paris) was a fairly significant departure from their normal model of developing and maintaining “street furniture,” but JC Decaux recognized that municipalities had an unmet need for sustainability products and services. 1 JC Decaux negotiated a deal with the Mairie de Paris to implement and maintain Vélib’ for ten years in exchange for the exclusive rights to over 1,628 city-owned billboards. 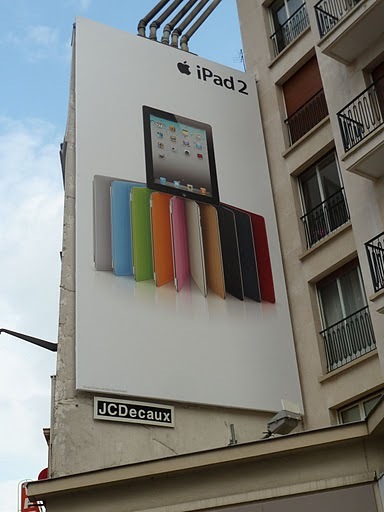 A JC Decaux billboard in the upscale Passy neighborhood. The start-up costs for Vélib’ were close to $140 million; it is the largest bike share program in the world with over 20,000 bikes in circulation and 1,200 rental terminals. JC Decaux reports that they employ close to 250 people who answer a customer service hotline, maintain the bikes, shuttle bikes between stations to accommodate demand, and fix glitches with the software program used at the rental terminals. 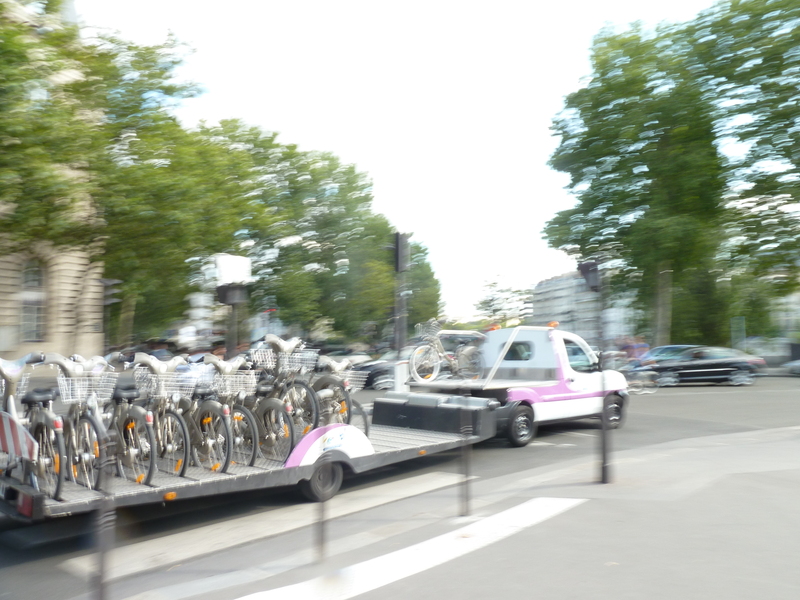 Electric trucks are used to shuttle the bikes from station to station or back to the repair shop. JC Decaux is an enormous, international corporation with net revenues of over 1 billion Euros in the first half of 2011. 2 They don’t disclose how much money they bring in from the advertising space they sell as a result of the Vélib’ deal, but one article I read speculated that it was around 80 million Euros a year. 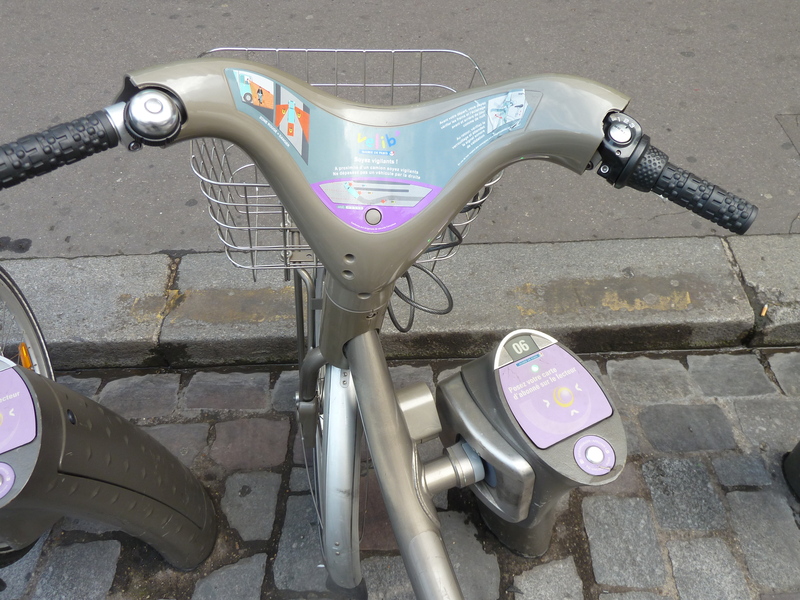 JC Decaux reports that they are losing money on Vélib’, but they have at the same time trademarked the bike share software, the design of the utilitarian Vélib’ bike, and other aspects of the program. They’ve branded their bike share program service “CycloCity” and have entered dozens of new markets in Europe over the last few years. 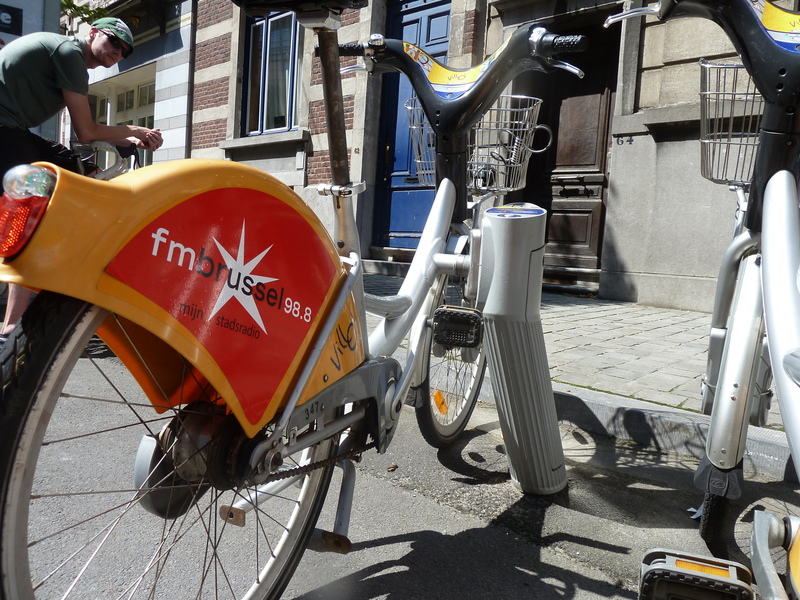 JC Decaux is running a small bike share program in Brussels called Villo. The bikes themselves are used as advertising space in Brussels which is not the case in Paris. Part of the reason JC Decaux claims they are losing money is because theft and vandalism of bikes has been rampant. Thousands of bikes have been stolen; some embezzled Vélib’ bikes have even been spotted as far away as Morocco and Hungry. Vandalism and a tragedy-of-the-commons mentality has also contributed to the need for high levels of maintenance. The JC Decaux maintenance crew repairs roughly 1,500 bikes per day and it is common to see riders give bikes a quick inspection before cycling away from a rental terminal. Not a bike you'd want to rent. You must agree to a 150 Euro deposit before you rent out a bike; the deposit is automatically returned to your credit card after you check the bike back in to the docking stations. There are rental terminals everywhere—they are spaced about 4 blocks apart from each other—so that Vélib’ users don’t have to worry much about where they are going to return a bike once they get to their destination. The bikes themselves are durable, but heavy (roughly 25 kilos/55 pounds), and have features like a protected derailer and internal gearing to reduce maintenance needs. Like all good utility bikes, each Vélib’ is outfitted with a basket, a bell, and front and back lights which are constantly on when the bike is in motion (powered by a little electric generator built into the hub of the bike). In order to use Vélib’ you need to be a member. Membership costs 1.70 Euros for one day, 8 Euros for a week, or 29 Euros for the year. Once you are a member, the bikes can be used for 30 minutes for free and if you return a Vélib’ to a station 60 meters above sea level you get an extra 15 minute bonus the next time you rent a bike as a reward for huffing it up a hill. Paris does have a few hills. 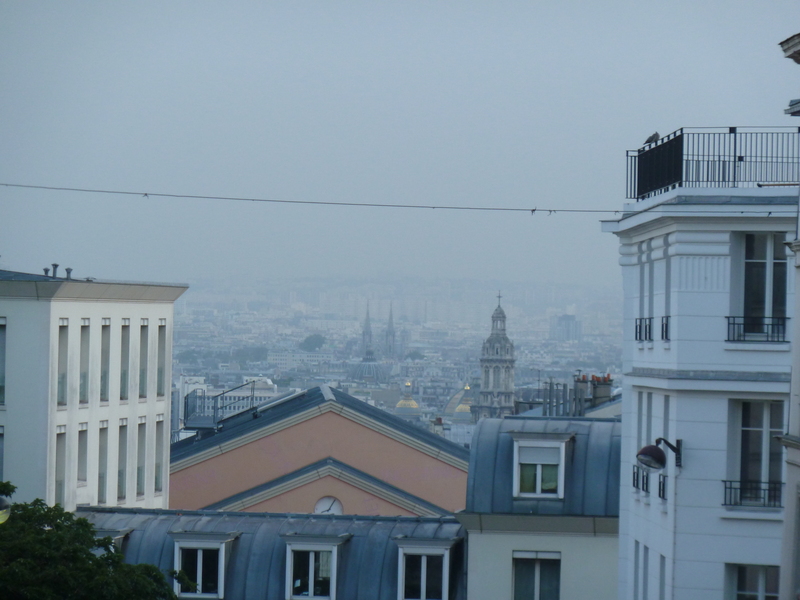 View from the Basilica of the Sacré Cœur in the Montmartre district. The pricing structure after the first 30 minutes is such that it discourages all-day recreational use. 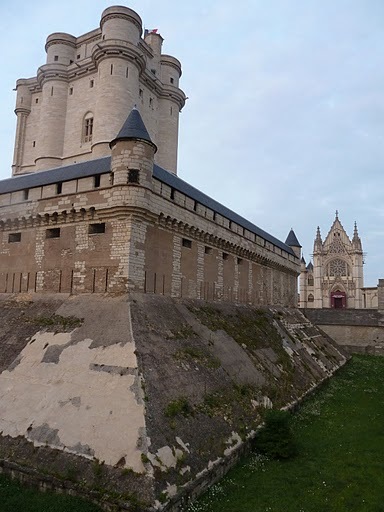 For example, a one hour rental (which is about how long it took me to get from Château de Vincennes in the far east of Paris to the Monet Museum on the western edge of the city) is 1 Euro, but a three hour rental will cost you 15 Euros. It should be noted that helmet laws make bicycle sharing schemes virtually impossible. Requiring riders to use their own helmets would significantly diminish the key value proposition of Vélib’—flexibility and freedom. Providing public helmets shared by millions of people could have serious public health implications (i.e., lice outbreaks). Even Washington D.C.’s bike share program allows adult riders to go helmet free since their helmet law is only applies to citizens under 16. Many reviews of Vélib’ include gripes about the rental terminal software malfunctioning or issues related to the time synchronization between different stations resulting in overcharges. 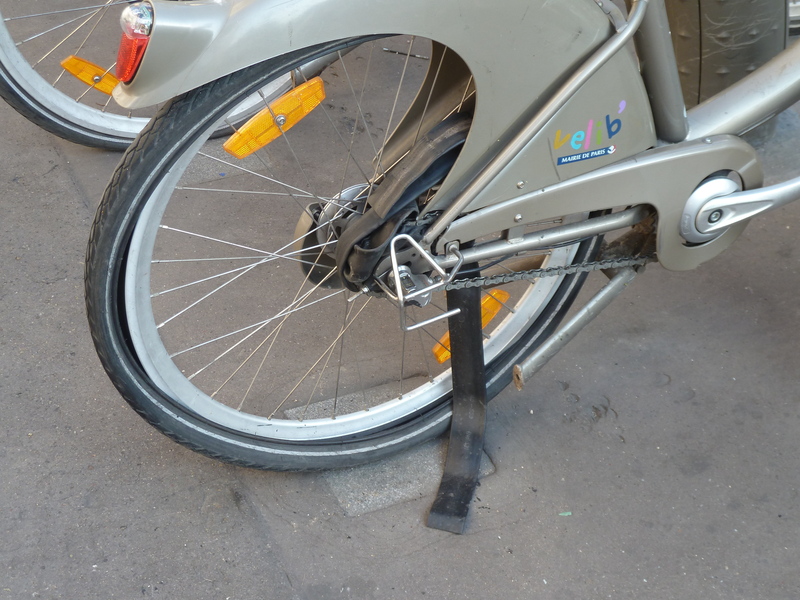 Despite the challenges, satisfaction surveys show that most Parisians are very happy with the Vélib’ program and most importantly—they are using the Vélib’ bikes. 100,000,000 Vélib’ trips have been taken as of this June and in the 1st quarter of 2011, Vélib’ had over 5.5 million rentals, the best 3-month period since the scheme was launched.3 The last time I visited Paris was in 2005 and I don’t remember seeing a single cyclist. Cycling in Paris is now a legitimate form of transportation. 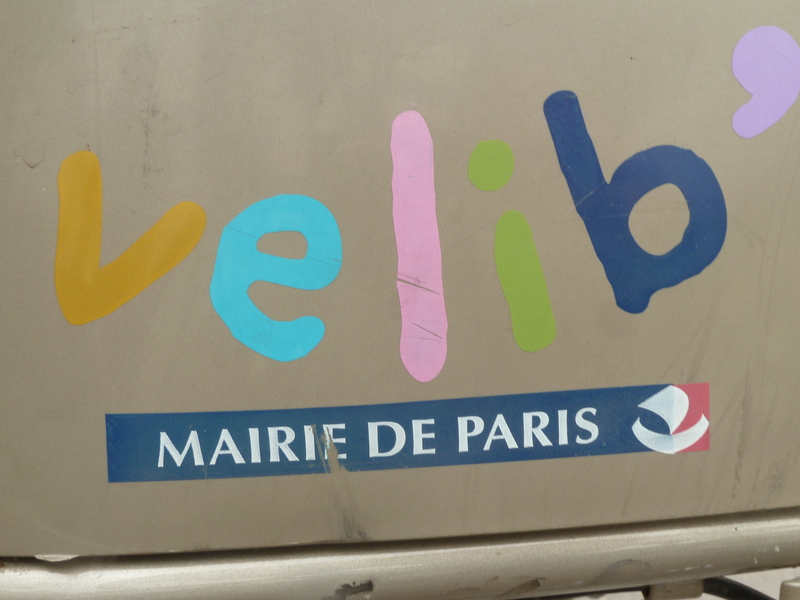 The name Vélib’ is a combination of two French words: vélo and liberté. Bicycle freedom. Some Parisians still seem to be experiencing the I-feel-like-a-kid-again feeling of freedom. Sometimes this translates into whistling, smiling, and general happiness while biking and sometimes the I-feel-like-a-kid-again feeling can cloud the judgment of normally responsible adults. Most Vélib’ riders—from teenagers to gray-haired men in suits—will occasionally dart through red lights to the chagrin of car drivers. The Paris police have had to step up their enforcement of traffic laws among cyclists and their efforts have helped remind cycling Parisians that they may feel free on a bike—but they are still beholden to the rules of the road. 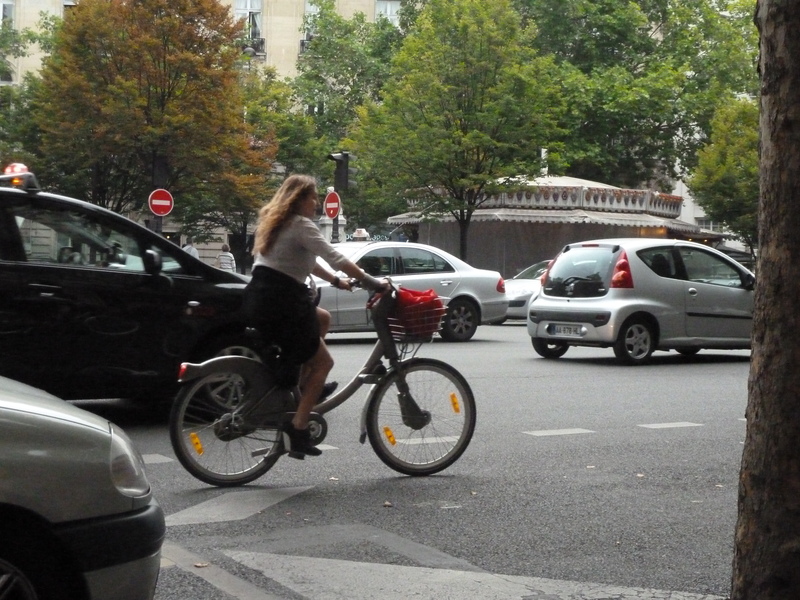 Still, the structure of cycling remains loose in Paris and cyclists are tacitly allowed to move between pedestrian areas and the roadway since the network of bike lanes is not yet complete. A few days ago I went for an evening ride through the Bois de Vincennes—the large park on the eastern side of the city—where there are wide paved paths for recreational cyclists. I’ve been riding my bike for hours each day all over the city, but I was craving an uninterrupted, traffic-free joy ride. There were plenty of riders on racing bikes, but I also noticed several riders—mostly women—on Vélib’ bikes who looked like they were doing the same thing I was: enjoying the soft evening light, getting a break from the city, and fitting in a little exercise. Vélib’ offers not only transportation freedom, but it has also provided busy adults with the opportunity to rediscover the feeling of levity a simple bicycle ride can afford. p.s. Sting rides a Vélib’ when he’s in Paris.